This motor is a different breed of cat from the Rivarossi motor in that it is a more conventional design. It is really not unlike many HO motors of the open frame type, just scaled down to fit into N scale locomotives. It is a five pole design as opposed to the Rivarossi three pole motor. Generally, this means that the motor will run more smoothly at very low speeds because of the extra poles which result in less "cogging" or jerkiness (although the Rivarossi motor can be made to run pretty smoothly at low speeds if the commutator is dressed properly). Here are views of three different Mehano motors. On the left is the single ended design used in the A1G RSC-2s, GP40s, and SD45s. In the middle is as it's used in the WDTs and 0-6-0 Steam locos (bottom view) and on the right is the double ended design used in some other locomotives Mehano built for other importers (the MRC RSD-15, for example). We, of course, are interested in the first two. The WDT motor has the magnet mounted above the armature instead of behind it but is still basically an open frame motor. Although the Mehano motor is fairly cheaply made, I have found the RSC-2 etc. version to be surprisingly robust. It is actually more reliable than the Rivarossi in that the commutator form isn't affected by heat unless the motor gets really hot. Of the Mehano locos I have, only one had trouble with this and that motor got sizzling hot and the winding insulation still didn't fry! The early WDT style motor does have a problem with the rear bushing plate. The plastic in which the bushing is mounted is fairly thin and the bushing will displace from the plastic softening from even a little too much heat, resulting in the armature rubbing on the pole pieces. Later units have a thicker section of plastic surrounding the bushing to aleviate this although I'm not sure if this improvement came during the A1G period. The 0-6-0 Steam Loco I have with this feature is an identical Life-Like unit (different road number). 1. The magnet and pole piece assembly. The pole pieces are the two flat and shaped metal pieces that extend toward the front (commutator) end of the motor and surround the armature at the top and bottom. The magnet is held in place by magnetism only although I have epoxied it in place in my A1G locomotives. 2. The rear plastic bushing plate and brass bushing right in front of the magnet. 3. The front plastic bushing plate/brush holder retainer and brass bushing at the front of the motor. 4. The armature assembly (shaft, core, windings, and commutator - see below). 5. The brush holders, insulating washers, springs, and brushes. 6. Thrust washers at either end of the armature shaft, usually one at each end although I have seen quite a few with no washer at the commutator end. 7. Two contacts which are retained between the brush holders and insulating washers. These appear to made of phosphor-bronze and are used to connect the lead wires from the trucks to the brushes. 1. The motor housing, including the front bushing and holes for the brush holders. This housing extends up the sides of the pole pieces and keeps them in place. This is looking rear to front with the rear bushing plate removed. 2. The magnet and pole piece assembly. In this case, the magnet is placed above the armature and the pole pieces extend down toward the bottom of the motor and surround the armature on each side as seen in the view above. 3. The plastic rear bushing plate and brass bushing which press-fits onto the motor housing at the rear of the motor. This is looking back as if from inside the motor. 5. The brush holders, springs, and brushes. Note this assembly has the extension type spring with larger diameter coils on one end (see Variations below). 6. Thrust washers as in the RSC-2 motors. 1. The windings. This armature is basically like the Rivarossi (or almost any other conventional motor, for that matter) except there are five poles instead of three. Instead of a coil wound around one "lobe" or pole, it is wound around two. 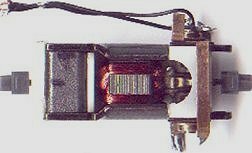 There are five segments on the commutator, of course, and the first coil is soldered (actually, I think Mehano used some kind of conductive adhesive - it doesn't look like solder) to a segment, wound around two poles, and soldered to the next segment. The next coil is soldered to this same segment, wound around two poles, and soldered to the next segment, and so on. If you look at a five pole armature, you will notice that the coils overlap each other. This would make rewinding a real task if the bad coil was not the outside one. You would have to remove all outer windings to get to the one that needs replacement. Thankfully, I have never had to consider this because I have never had one of these "burn out". 3. The shaft, of course. Function is pretty much the same as for a three pole motor except that there are more bursts of energy going to the coils per revolution, thus resulting in smoother rotation at low speeds. Variations in these motors are minor. One, regarding the RSC-2 style, is sometimes Mehano used black plastic to mold the plastic parts and sometimes white. There can be a combination on any given motor. Also, there are two different methods Mehano used to get brush pressure against the commutator. Two different types of springs are used. One is a compression spring and pushes on the back of the brush toward the commutator. The other is an extension type and has larger diameter coils on one end that rest on the lip of the holder. This type pulls on the back of the brush toward the commutator. Either way, the same results are achieved and there will be consistancy within any given motor as to what type was used. On the WDT style motor, some of them don't have any covering over the magnet on the top of the motor and some do. Again, magnification is important to successfully operate on these. The same rule applies here regarding the power-up of the motor beforehand to determine likely causes (if any) of malfunction. In this case, rubbing of the armature on the magnet pole pieces indicates a displaced bushing in one of the end plates. On the RSC-2 style motor, there are insulating washers between the holders and the pole pieces. The contacts for pickup lead connection go between the holders and the insulating washers. Now, remove either the gear (WDT style) or coupling (RSC-2 style) on the end of the shaft. These easily pry off with a screwdriver. Note the spacing between the gear or coupling and the end of the motor so you can get it in approximately the same position when reassembling (final adjustment is done after the motor is reinstalled into the locomotive). The plastic front bushing plate/brush retainer can now be removed. This is done by slightly spreading the magnet pole pieces so the bosses on the plate can clear. While we're at this point, I will mention the magnetic field weakening issue. If a motor is assembled and THEN magnetized, the field will be considerably weakened if the components (magnet, pole pieces, armature) are separated during motor disassembly. This results in a poor performing motor after it is put back together. The motor will usually run at a higher speed but draw a lot more current and not have nearly as much torque as before. Since the current draw can be excessive, the motor windings can get hot enough to burn the insulation - not good. I learned this the hard way with my Treble-O-Lectric locomotives and I had to rewind the armatures on them and then build a remagnetizer to restore the field strength. Of course, I was just ten or eleven when I disassembled them and had no knowledge of this particular trait of some motors. And even though the Treble-O manual warned, and I quote, "You will permanently damage the electric motor if you dismantle the magnet assembly by removing a pole-piece", I really had no clue as to what it meant. I mean, I figured if I took it apart and put it back together exactly like it was, everything should be hunky-dory right? Wrong! OK, with that said, if a motor is merely assembled and NOT magnetized afterward, there will be no appreciable field strength loss if the components are separated. In the case of the Mehano motor, I do not believe they magnetized them after assembly so it shouldn't matter if the pole pieces are separated from the magnet or the armature is removed from the field. However, I have never been quite comfortable with this and so I install a "keeper" across the pole pieces when I remove the armature and never let the pole pieces completely separate from the magnet. A keeper is any flat piece of ferrous material that you put across the pole pieces anywhere along their length to keep the magnetic field intact. The armature can now be removed by pulling it straight out (keeper in place if you're chicken like me). Note the thrust washers and don't lose them! This should be all the farther the motor has to be disassembled for service. However, if the rear bushing plate needs repair, it is tough to get it out without separating the magnet from at least one pole piece so you'll have to take your chances and hope the field will be OK after reassembly (I think it will). Since the front bushing plate is integral with the motor housing, the armature is removed by pulling off the rear bushing plate. Sometimes you can just pull it off with your fingers but usually you have to pry with a screwdriver on the two tabs on either side of the rear of the housing. These tabs are flush with the sides of the housing so just stick the screwdriver in there at the front of the tab and kind of twist. It's easy. Here I have to admit I have removed the armature in these motors without the benefit of a keeper across the pole pieces. I tried it before but the keeper had to be a curved piece and, more often than not, I would knock it out of position anyway. In any case, my supposition that the magnetic field won't be weakened seems to have borne out. They seem to run the same afterwards as before. Now, just pull the armature out from the rear of the motor, again keeping track of those thrust washers. This is pretty much the same as for the Rivarossi motor so refer to this section on that page for particulars. A good inspection is the key. Resistance measurment between any two adjacent commutator segments will depend on whether a smaller (15 laminations) or larger (18 laminations) armature is used - the coils are longer on the larger armature and thus have more resistance. It should be about 15 ohms with the smaller units and 18 - 20 ohms with the larger units. This is, again, assuming all coils are good and connected. In spite of this difference, the current draw of either armature seems to be about the same in an assembled, running motor (a little over .1 amps.). The WDT style motors use the smaller armature exclusively (the larger one wouldn't fit). As mentioned on the RSC-2 page, the early units use the smaller armature and later units use the larger armature. An important thing to look for when inspecting the armature; at the rear, some of the plastic extensions from the armature coil insulation that encircles the shaft insufficiently protrude beyond the coils or are even recessed below them. This is not good because it will allow the coils to rub on the rear bushing plate and eventually wear through the wire insulation. This area must be built up either with a spacer or stacked washers. With washers, however, you must be certain that they will not contact the coils because this will also ruin the insulation. The best is a plastic tubular spacer epoxied in place so it can't turn independantly of the armature. I would say the most common problem affecting both styles of motors is poor "soldering" of the windings to the commutator tabs. These look like they were actually glued to the tabs with a conductive adhesive. The fix is to use real solder to reattach them. This must be done carefully and quickly, of course, so you don't melt the plastic commutator form. Another issue is noise which may be caused by loose bushings or uneven spacing between the armature and pole pieces. Not too much can be done about loose bushings other than to try and reduce the inner diameter by using a drift (a flat ended punch) and tapping with a small hammer against the bushing while supporting the other side of the housing at the bushing. This is risky though as the housing may crack. The uneven spacing causes noise as it sets up vibration because of the uneven attraction and repulsion of the armature poles to the pole pieces.The fix is to bend the pole pieces in the rounded area so the spacing between them and the armature is the same at all four edges of the pieces. With WDT style motors, the big problem is the rear bushing displacing in the bushing plate from heat. First of all, all bushings used in the Mehano motors are kind of cheesy to begin with. They are actually merely eyelets formed from sheet brass and not solid bushings as on the Rivarossi motors (why didn't the two get together and use Rivarossi's bushings and Mehano's commutators?). Of course, when the bushing moves, so does the armature and ends up rubbing on the pole pieces - bad. I have repaired this by using a soldering iron to gently move the bushing back to where it belongs and then epoxying it in place. The "back to where it belongs" is the tricky part. It's kind of a trial and error procedure. Move it so it looks right (in the center of the circular part of the molding), reinstall the armature and bushing plate, and see if it's OK. If not, note which way the bushing has to go to stop rubbing, disassemble, move bushing, and repeat the trial. Of course, you have to be judicious with the heat or you will ruin the bushing plate completely. It was a loss anyway, right? Reassembly is basically the reverse of disassembly, adjusting the armature end play if needed and keeping it centered (washers!). Some of them have way too much end play. I like to have the barest minimum with just enough to allow for expansion as the motor heats up. Centering the armature isn't as critical as with the Rivarossi motors because there are no flanges on the commutator for the brush holders to rub against. General principles, however, dictate that the brushes contact the commutator segments as close to the center as possible. Turn the armature by hand to ensure that there is no interference caused by a displaced bushing or whatever. With these motors, you can turn the brushes in the holders after installation with the point of a needle to line up the arc in the brush with the curvature of the commutator. Of course, if you are installing new brushes this won't apply but, ideally, the new brushes should be "pre-curved" to match the circumference of the commutator. On the RSC-2 style motor, be sure you get the contacts for lead wire connections between the brush holders and insulating washers, not between the washers and pole pieces (instant short circuit! ).